TKO Studios is a new publisher using an innovative model, whereby they publish miniseries that aren’t offered for sale until they’re completed. And when they’re up for sale, they’re available in 3 different formats - digitally, oversized trade paperback, and as individual floppy issues in a nice display box. But all of the interesting formatting and sales choices don’t mean anything if the comics aren’t good and interesting. Thankfully, I’m happy to report that thus far, from what I’ve read, TKO studios seems to be succeeding on the most important front, which is creating quality comics. My colleague Scott recently looked at Sara, and I'm looking at the terrific The Fearsome Doctor Fang (Doctor Fang for short). The story follows officer Nayland Kelly in 1906 San Francisco. Two years earlier, his brother was seemingly killed by the villainous Doctor Fang, and Nayland isn’t taking it well. While on duty, Nayland encounters art and history expert Alice Lecroix, who isn’t exactly what she seems. She’s coming to San Francisco with an interest in a fabled artifact belonging to Kublai Khan. Through a dramatic series of events, Nayland and Alice encounter Doctor Fang, who is not what he seems. And from there, adventure across the globe ensues. 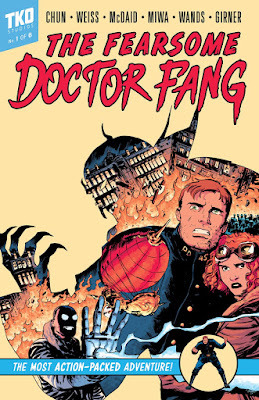 Doctor Fang is squarely in the “pulpy adventure comic” genre (in the tradition of Doc Savage and Corto Maltese, and one of my recent favorites, Five Ghosts), which I absolutely love and want to read more of. If a comic can give me the thrills I get from old-fashioned adventures like the Indiana Jones movies, that’s a strong selling point. I love high-tech sci-fi stories as anyone, but there’s something immensely satisfying in a story where not everything can be solved by a computer or a GPS locator. A little bit of mystery and magic and certainty goes a long way for me. In Doctor Fang, the entire creative team has done terrific work here. This is a story that really moves along. Chun and Weiss have an excellent ear for dialogue, not surprising given their TV writer background (Gotham and The Mentalist, respectively). The book is written with a very readable, crisp patter between the characters that feels era and genre-appropriate. And while the story doesn’t stop to take much of a break, the pacing still feels entirely appropriate and manageable (as this is a “race against time” story). Quick pace notwithstanding, there’s some strong character development as we follow Nayland, Alice and Doctor Fang from one place to another, and get to know them from their actions and from their reactions to circumstances. This is a comic that has fun and joy and action and derring-do on every page. 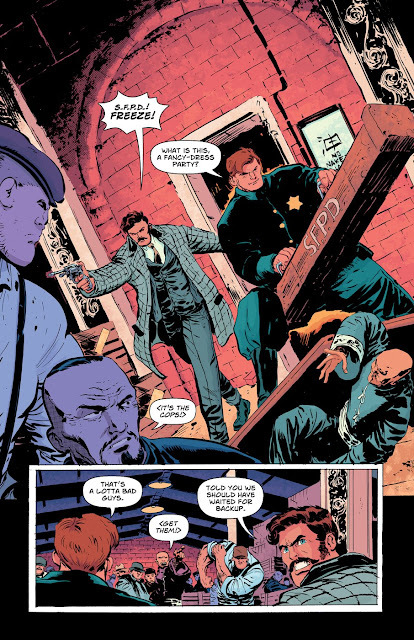 The engaging, fast-paced story (by Chun and Weiss) is brought to gorgeous, pulpy life by the spectacular team of Dan McDaid on art and Daniela Miwa on colors. I’ve been a big fan of McDaid’s work for a number of years now, which I first encountered on the wonderful Vandroid (note: if you’ve never read Vandroid do yourself a favor and read it now). He’s got a rich, detailed style with a gritty, realistically-exaggerated feel to it. In Doctor Fang, McDaid uses a slightly cleaner line but never loses his gritty feel, which gives the art sort of a Alex Toth (classic, clean lines and storytelling) meets Geoff Darrow (gritty, hyper-detailed, kinetic action) feel to it (which hopefully makes sense, it does in my head). 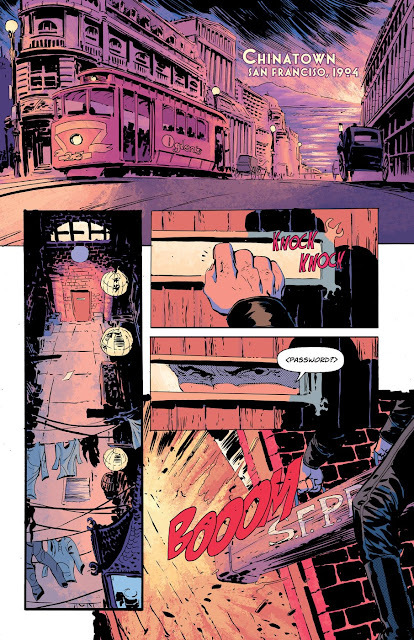 McDaid puts an incredible amount of detail into each page, each panel of this book. The skyline of San Francisco, a Chinese-stylistically influenced airship, the alleys of Shanghai, speeding trains, remote and delicate mountains - McDaid is at home bringing a skillful eye for detail to all of those environments. And he’s more than just a skillful artist, he’s also a first rate sequential storyteller. He uses varied panel layouts to convey tons of action in a way that makes the story easy to follow and fun to read (no mean feat in comics these days). McDaid has an excellent artistic partner in Miwa, who really does incredible and varied work in Doctor Fang. I first encountered Miwa’s work in The Old Guard (another fantastic world-spanning adventure you really must read). Miwa’s color palate in this story is slightly more “realistic” than that in The Old Guard (which used a lot more monochromatic color schemes and use of light and shadow) but Miwa still brings a ton of style and storytelling skill to the table. Significant parts of the first issue take place during the San Francisco earthquake of 1906 and Miwa brings the fire and panic of that night to vibrant, terrifying life. Conversely, in other scenes, Miwa conveys shadow and darkness in incredibly effective ways (it’s not always easy to convey nighttime in a comic without just making everything dark, but Miwa brings the skill here as well). And the entire comic had just a little bit of a faded color quality to it which gives the comic a slightly aged, timeless quality. This is the sort of effect that if pushed too far could become gimmicky, but that doesn’t happen here. It works perfectly in conveying the sense of “classic adventure” without hammering the point over the readers head. The strong attention to detail and quality in this book (and my impression, in TKO books generally) extend to the lettering and design elements as well. As a skilled, experienced letterer, Wands does excellent lettering throughout the book, giving the character of Doctor Fang in particular a fun, appropriately fearsome font choice. There’s also some excellent sound effects lettering through the book by the creative team. And the oversized trade paperback (the format in which I read the book) looks great, thanks to the design work of Fletcher (whose work on Paper Girls (and other books) I absolutely love). Their presence, along with that of veteran editor Sebastian Girner, is a strong signal that the TKO team is interested in making top-notch comics. Not surprisingly, I highly recommend picking up The Fearsome Doctor Fang. It’s classic pulpy adventure with great attention to detail and storytelling, and a very enjoyable read. I hope to read more stories set in this world.